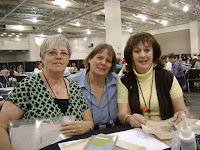 Today was the last day of convention and although it was a fantastic day, I'm in the hotel feeling a little sad that I won't see my stampin' sisters for awhile. BUT, it was a great day and so I'm going to focus on that. This morning we started with classes and they were super. Next my group went on to make and takes. While, I chose to go and take pictures of displays my friends all worked hard on their projects but before I did we had to take pictures, of course. Left is Leslie, me and Joni. Right is Lynne, me, and Linda. 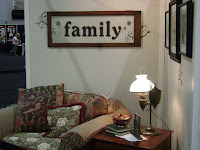 The display boards were fantastic as usual but this year, we had some very different types of displays including displays of Decor Elements and displays of things made with the new Sizzix line. 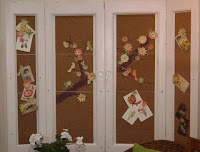 Here are a few shots of Decor Elements Phase 2! 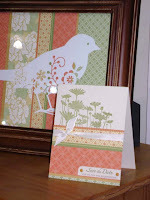 Here are some pictures of things done with the SU exclusive Sizzix dies! 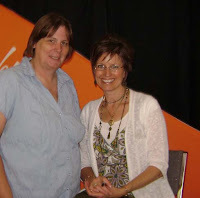 After taking photos and talking with the Sizzix representatives, I decided I was going to stand in line to see Shelli. With me celebrating my 5 years with SU and SU celebrating 20 years, I felt a picture and a short talk with Shelli was warranted. Not only did I get to talk with her, but her dear, sweet husband Sterling took our picture and he did a decent job. Of course Shelli looks as beautiful as ever andd I look like someone who has had very little sleep for the last 4 days! While I was waiting Sterling asked me if I had enjoyed convention and I told him it had been the best one yet and he said to me, "well let me just tell you that you don't want to miss closing session." After the week we've had with all the great announcements, the fun, the excitement, I really didn't know what to expect. After lunch, our group made out way to the main stage seating area and we almost didn't get seats together. We ended up way in the back bleachers but as it turned out it was a great area. 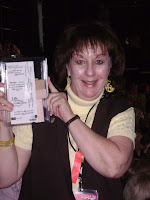 First Linda Hansen came out and talked to us about changes that Stampin' Up! has gone through the years. Then we had some FANTASTIC main stage demonstrations. In between the demonstrations A LOT of prizes were given away. I was one of the lucky gals to win the Crazy for Cupcakes set, matching wheel, and the icing on the cake (no pun intended) the wide chocolate chip stitched ribbon! 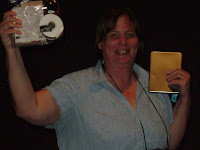 Here I am with my fantastic prize bundle. 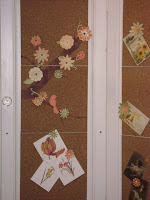 After the annual Stampin' Up! 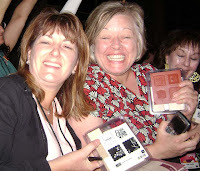 game show, my friend Linda won a stamp set. In fact, I think about half the people in our section won prizes this afternoon! Here's Linda with her stamp set. Next, Shelli came out to give the closing remarks. 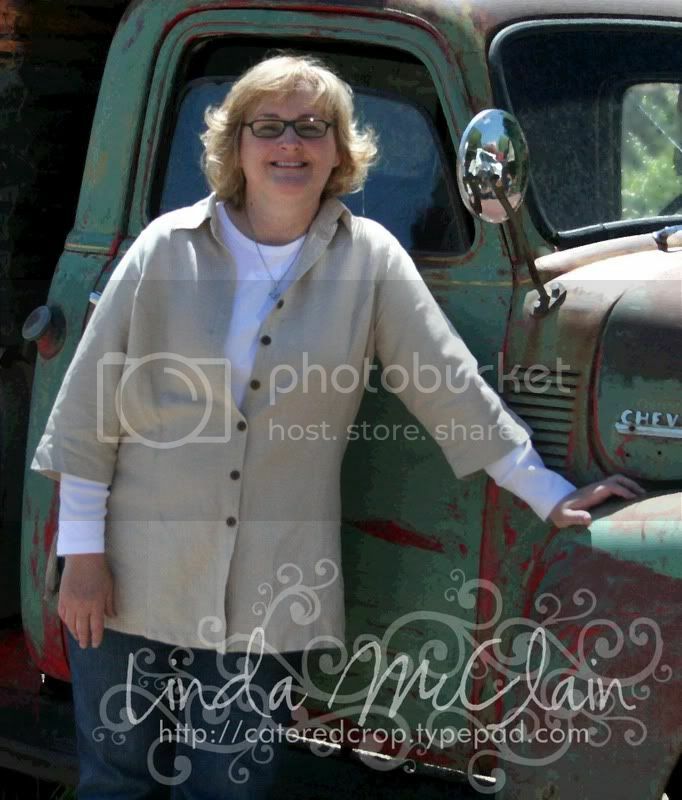 As she was giving her remarks a loud door bell rang and it walked a handsome UPS man with a package. He said he thought he was in the wrong place but said that it said to deliver to the Salt Palace. Shelli asked him who the box was for and he said, "it says everyone!" Well, as you can imagine the crowd went wild, the door opened up, a UPS truck drove in, a lot of UPS men and women came running out with UPS bags filled to the brim with the new Ronald McDonald set Say It with Scallops and began running up the isles and bleachers delivering our sets to us! Confetti was flying everywhere, music was blaring, fireworks were going off. It was just a crazy, amazing, and wonderful scene. If you don't believe me, see for yourself! Here's Shelli with the hunky UPS man. Here's the truck driving in and then the confetti falling all around. Here are some pictures of some very happy demos with their new rubber. 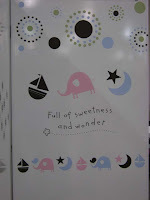 Next, Shelli told us that UPS had purchased the stamp sets for us so of course we went wild with applause and cheering. Once we had quieted down she asked us through her tears to help her thank her staff for all their hard work this week which we were more than happy to do so. After that it was time to say goodbye to friends I won't see for awhile. It was a heck of a day (and week) and as always I can't wait to return to Salt Lake City next year! Thanks to everyone who has checked out my blog this week and left all the kind comments. I have so enjoyed sharing my convention experience with you. If you are a demo reading, I hope you will start planning now to attend convention next year. There's just nothing like it. If you aren't a demo, consider becoming one before next year so you too can join in on the fun and excitement!! Tomorrow I have a long travel day ahead of me so I'd best sign off and get some sleep! How exciting! It sounds like you all had tons of fun! I am hoping to be a demo next year (my mom is one right now). Taking a trip with her to convention would be wonderful! I'm hoping for that! Thanks for sharing all the highlights! It has been fun reading all your news! I was supposed to get to go this year had a room booked and everything but life just didn't let me go. I'm planning for next year though. Your blog made it bearable though you did such a good job of sharing the experience with us! Thank you so much! Okay, I am pathetic. You had me in tears by the end of this blog. It looks like so much fun. The boys said you should have taken me with you and I have to agree. Glad you had a great time. Thank you so much for sharing your experience at Convention with everyone. I am a Demo but unfortunatley was unable to go to Convention. I have enjoyed reading your blog. Thank you for sharing. Thank you for losing some sleep to capture and share the excitement of convention, especially for those demos who were there vicariously through you! Thank you for your reports at the convention. I have been looking every day. I am not a SU demonstrator but mine was there and I feel like I can enjoy a little tiny bit of what she did. I watched your video and tears came to my eyes. Thank you, thank you thank you. Have fun using your new toys and sharing your excitement and talent with you customers and friends.